Lifeline® Normal Human Monocyte-Derived Dendritic Cells provide an ideal culture model for the study of the initiation of immune responses, delivery of antigens to dendritic cells, cytokine production, vaccines and Toll-like receptors (TLRs). Lifeline® Dendritic Cells are derived from monocytes that have been cultured with IL-4 and GM-CSF. 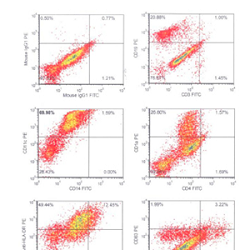 Our Dendritic Cells are quality tested via flow cytometry to ensure proper expression of dendritic markers. Dendritic cells express CD11c and HLA-DR. The expression of CD3 (T cells), CD19 (B cells), and CD14 (monocytes/macrophages) are used to ensure depletion of these cell types. CD80, a maturation marker, is also measured for informational purposes. Lifeline® Cell Technology provides products using the highest quality raw materials that incorporate extensive quality assurance in every production run. Exacting standards and production procedures ensure consistent performance.